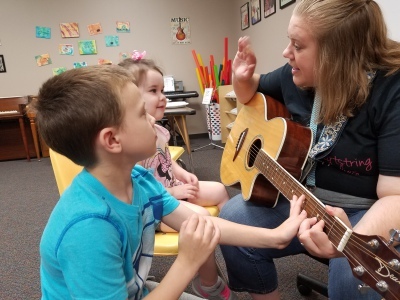 Referrals can be made by the client, family member, caregiver, teacher, physician, or any other individual who desires the client to have access to music therapy services. The music therapist will schedule a free initial consultation to go over relevant information and questions. To request an initial consultation, please contact us. After the consultation, you will be asked to fill out intake information that will assist in the assessment process. During the consultation, the music therapy assessment session will be scheduled. A comprehensive assessment of the client’s strengths and needs is performed across the multiple domain areas of social, emotional, communication, physical, sensory, cognitive, and music. The assessment process is a period of time that can include one or two music therapy sessions, intake information, consultation with other professionals involved in treatment, and observation outside of the music environment. After the assessment is complete, results will be written up in the form of treatment goals and objectives. Once the assessment is complete, the client may begin music therapy treatment. The treatment includes tailored music experiences to target the goals and objectives created during assessment. The interventions may include re-creative, improvisation, receptive, and compositional experiences that are based around instrument playing, singing, movement, song writing, and music lessons. Data will be collected after each session to notate progress towards goals and objectives. At the end of each treatment period, the music therapist will review the data collected. The client’s progress will be evaluated to determine progress towards goals and objectives. At this point in time, the music therapist will update the treatment plan to reflect attainment of objectives or renew the objectives for another treatment period. If it is determined that there are no more goals and objectives for treatment, the therapist may recommend termination of music therapy services and discuss with the client, family, and/or caretakers.